The question whether video games are art has been bothering gamers, journalists and critics alike for a long while. Proponents might say that art is subjective, that anything capable of eliciting a deep emotional response could be considered art. Then, perhaps, there is no greater argument for calling video games art than Team ICO's work. Ico and Shadow of the Colossus, released in 2001 and 2005, respectively, left a huge mark on the PlayStation 2 community. Both instant classics, they won over their audience with their unique atmosphere, emotional story, deep characters, and fresh gameplay. 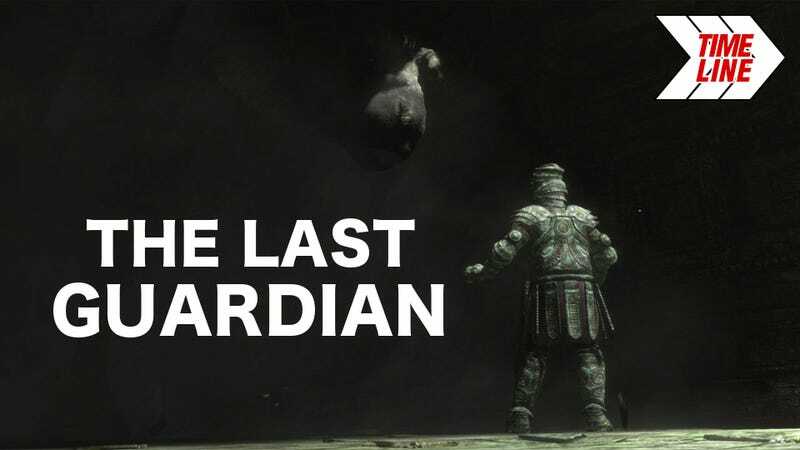 Team ICO creative lead Fumito Ueda's latest creation, The Last Guardian, however, suffered many hurdles during its long development. In this Kotaku Timeline, we follow TLG's evolution from just a rumor to a solid, confirmed title. We look at when, why, and how Sony delayed the game, and also collect all the details and bits of information they, and Team ICO, released. We will also remain on the lookout for announcements and events, both good and bad, in the future. At a German Sony-organized MotorStorm-related event, a Sony employee reveals to a fan that Team ICO is working on two games. Wow, two games! None of it gets confirmed, of course, but it's something. October 10—The Last Canyon? What is that? Kotaku, with the help of Game Informer's Andy McNamara, squashes the rumor that Team ICO's new game would involve deserts, gliders and lots of canyons. Sony Japan updates Team ICO's career page with an image, and an announcement that they're now hiring for the developer's next project. Yoshida: "They haven't released a PS3 title yet—but they have something really, really good on the way." Sony's Shuhei Yoshida asks everyone to be patient—the wait will be worth it. Ueda: "Although I do get pressurised, that's not happened yet [on the current project]." Ico and Shadow of the Colossus creator Fumito Ueda divulges a few details to gamesTM about his new game—in particular, that it's nowhere near ready development hasn't reached the cricital stage yet, meaning there's still a long way to go. VG247 asks Yoshida if Team ICO's new title would be ready to be shown to the public at Tokyo Game Show 2008. He says he doesn't know—turns out he was right not to make any promises. Eurogamer confirms that the series' creative lead will be attending next month's Game Developers Conference. Ueda: "Probably, it will be similar to... um... Well, the essence of the game is similar to ICO." Ueda does appear at the GDC, and he does mention something about the new game. It's not too much, but, to be fair, he actually wasn't allowed to say anything. PlayStation Lifestyle reveals an almost four-minute video which features scenes of interaction between a boy and a large, furry, feline beast. A few instances of cooperative platforming are also shown. At one point, the title "Project TRICO" appears. A new video, this time four and a half minutes in length, is shown at Sony's Press Conference at E3 2009. In addition to a few new images and better quality, we also learn the new game's title: The Last Guardian. Before he could slip away, IGN manages to snag an interview with Fumito Ueda, who agrees to divulge a few things about several different aspects of the game—namely Trico's (the creature's) design, and gameplay. June 10—The first batch of screenshots is here! Some from the trailer, some brand new. Here's the very first batch of great-looking high-res screens for TLG. Wherein we recognize The Last Guardian as one of the biggest reveals of E3 2009. September 17—Here's why it's called "The Last Guardian"
Kobayashi: "The Japanese market is only one fifth of the global market (...) Unless we gain success in the overseas market, our studio will go bankrupt." Sony Japan's Vice President Yasuhide Kobayashi tells Games Industry that the game was titled "The Last Guardian" to appeal to western audiences. A fine decision—"The Giant Man-Eating Eagle Toriko" doesn't quite have the same ring to it. He also speaks about the importance of proper localization. And Kotaku is there to liveblog it. The video to the left is shown during the presentation. Ueda: "There's a lot more we can do with the PS3 so there can be more dynamic developments in the game." Fumito Ueda tells Kotaku all about his love for cats, how his love for cats influenced the creation of Trico the creature, and how the PS3 is the perfect console for TLG. Sony Japan launches the official website for TLG, and immediately uploads a whole bunch of screenshots. Ueda: "At the time of the E3 announcement, the tremendous response was a shock to me personally." Fumito Ueda tells Famitsu that he'd like to make new announcements this year. Does that mean E3? TLG is absent from E3. That means no announcements until fall. Sony confirms that The Last Guardian will be there at the next Tokyo Game Show. Team ICO comes to the Tokyo Game Show bearing gifts; a new trailer, new screenshots, and a promise for a 2011 holiday release. I'm not sure about the last one, but new media is always welcome. Follow the link below for Kotaku's event liveblog. Ueda: "We wanted to show a bit more of the emotional attachment between the boy and Trico." PSB-EU talks to Fumito Ueda, who details intentions, inspirations, and mentions the main characters of TLG. The company working on adapting Shadow of the Colossus to the big screen tells Play Till Doomsday that there are no plans to do the same for neither ICO nor The Last Guardian. Ueda: "I would describe [TLG] as an adventure game that you play with [Trico]." PSB's interview with Fumito Ueda from last week was apparently too lengthy for a single post—here's the rest of it. The ICO head honcho speaks about what kind of game TLG is, the relationship between its two main characters, and what makes video games art. ?—We almost got a demo. Almost. Ueda tells 1UP that the team's considering including a TLG demo in the upcoming Ico & Shadow of the Colossus Collection. It doesn't exactly work out. Ueda: "I think each player will have a different Trico to work with depending on how he or she chooses to interact with him." Ueda describes TLG's gameplay as part pet training. At a private Sony-held event, the press is shown a so-called "vertical slice", that is, a demonstration of the unique elements of TLG. Here is Kotaku's account of what transpired. Ueda: "I'm making the game so that it's appealing, with the hope that many people will give it a try and love it." Ueda expresses his desire to avoid making the mistake of creating yet another award-winning title cherished by thousands with The Last Guardian. On a more serious note, what he wants for his next game is a wider appeal—which is understandable. Ueda: "To provide more challenging and better quality of content (...) I decided to postpone [TLG's] release timing." Things do not go as expected, and Team ICO delays all their upcoming games. Although the Ico & Shadow of the Colossus Collection does come out this year (albeit slightly late), TLG is nowhere to be seen. Even with no release date, there's still something coming: according to the PlayStation Blog, the upcoming Team ICO rerelease disc will have TLG-related behind the scenes footage on it. Well, it has been a pretty good year. Let's not get greedy. Courtesy of PlayStation Blog, here's part of the bonus footage from the upcoming Ico & SOTC Collection. The whole clip can be found to the left, courtesy of IGN. November 30—Uh-oh. Did Ueda just leave Sony? Eurogamer says that Ueda has parted ways with Sony. Supposedly, this doesn't affect TLG's development, which Ueda will reportedly finish working on as a freelancer. A tweet reveals that Ueda and co. are still hard at work, regardless of their leader's current relationship with Sony. Last Guardian executive producer Yoshifusa Hayama throws in the towel and leaves Project ICO. Sony finally confirms to Gamasutra that Ueda has left the company—adding that Ueda is contractually obligated—and willing—to finish work on The Last Guardian. A mistake on GameStop's part causes panic amongst the already nervous TLG pre-order crowd. Yoshida: "The team's always been making progress, but there are lots of difficulties." Head of Worldwide Development for Sony, Shuhei Yoshida, says that while there are hurdles to overcome, The Last Guardian will absolutely see the light of day. Sony tells Wired that Ueda and co. have enlisted the support of several studios scattered around Europe and North America, including the folks behind God of War, Sony Santa Monica, to help finish TLG. June 5—Nothing at E3. Where is it? We express our disappointment over TLG's absence from E3 2012. Rohde: "Gamers are first. And the experience that we provide is first. And that's why we're going to talk about that game when we're ready to talk about it." Sony's VP of Product Development Scott Rohde tells GameSpot that they refuse to reveal anything until everything's absolutely perfect and ready. Or maybe not. In any case, Michael McWhertor brings us this gem of a trailer re-imagining. Ueda: "I can't really comment on the details." Kotaku catches up with TLG's creator, who offers a few (very few) words of reassurance. At least there still are "details" that can't be commented on. Sony's trademark registration for "The Last Guardian" expires. Kotaku explains why this news shouldn't scare anyone. Also, Sony confirms that the game is still being worked on. Yoshida: "The engineering team had to go back and re-do some of the work they had done." Sony's Shuhei Yoshida offers an explanation to Eurogamer on the continued delays and unmet deadlines. It is revealed that Sony has actually already filed for a new TLG trademark. Phew! Sony dev: "I give you my word that it exists." A mysterious, unnamed Sony developer talks to Kotaku about TLG's development, but sadly he doesn't offer much more than a "yes, it's still being worked on". November 7—No TLG in 2013. In fact, no TLG for a while. Yoshida: "The team is working hard on the project, including the engine." CVG's interview with Shuhei Yoshida reveals that Sony, so as not to disappoint any more people, won't commit to a release date just yet. December 20—There goes another year. How disappointing. Kotaku names the lack of TLG news one of the great disappointments of 2012. A redditor shows off his hand-made custom speaker enclosure. Trico included! Fumito Ueda finally appears in an official Sony video after a long period of absence. He... doesn't really do or say anything interesting. Kotaku is not pleased. Ueda: "TLG remains under my creative supervision and is still in development by an incredibly talented team." Ueda writes on his website that the game is still being worked on, and tells everyone to look to Sony for any announcements. ... Yep. That's all. Yoshida: "We're going to talk about it when we can."